You like to save money, right? Who doesn't? Believe it or not, many people are still content to pay their energy bill each month and never question whether it could be lower. 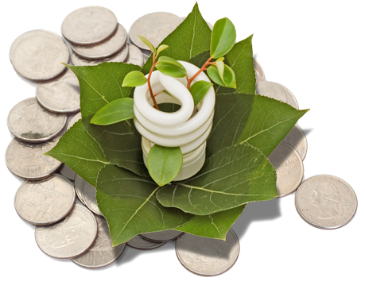 Lowering your energy bill can be accomplished easily by improving your home's energy efficiency. We've collected three ways you can improve the energy efficiency of your home to lower your energy bills immediately. Even the smallest changes in temperature can greatly impact your home's energy efficiency – particularly for homes in areas that experience extreme heat or cold. Adjusting the thermostat to 68 degrees or lower on winter days, and 78 degrees or higher during the summer, will help you use less energy. Adjusting the temperature further during the night will save even more money. Family members will take time to adjust to the new temperatures, but after 7-10 days, everyone should be fully acclimated. Natural sunlight can also have a big effect on the home's energy efficiency. Open windows to let in sunlight during the winter and close curtains to keep it out in the summer. This could help you adjust your thermostat to a friendlier range. Finally, adjust the temperature on the water heater to sit between 120 and 130 degrees. Some homeowners may be compelled to lower the temperature further, but should hot water be depleted too quickly, the electricity required to heat more will eliminate any energy-efficiency savings. As additional technologies invade American households, they are seldom unplugged or powered down. Subsequently, the home's energy efficiency suffers. Unplug rarely used appliances to decrease energy usage around the house. For instance, a basement or garage refrigerator left unplugged when not in use can save a homeowner $10 a month in electric bills. Charging devices for phones, tablets and digital cameras can also reduce a home's energy efficiency and should be unplugged when not in use. The increase of home technology has also caused many homeowners to opt for power strips to meet current energy demands with only a limited number of outlets. These strips should be turned off when not in use, as even the standby setting can drain as much energy as a 75 or 100-watt light bulb that runs continuously. Investing in Energy Star appliances will improve the home's energy efficiency immediately, but there are many ways reduce energy expenses with the family's current appliances as well. For example, the refrigerator is often the home's leading energy user, so it's important that it operates efficiently. Keeping the door closed as often as possible is an important first step, and the door's seal should be checked to ensure it’s secure. Set a dollar bill between the door gaskets and try to remove it. It should be difficult to do so; if it slips out easily, the seal is not as tight as it needs to be. Like the home's thermostat, the refrigerator can also have its temperature adjusted to improve energy efficiency. The temperature of the refrigerator itself should be set from 38-42 °F, and the freezer between 0-5 °F. Simple lifestyle changes can improve energy efficiency with other appliances as well. Avoid pre-heating or opening the oven door unless necessary; clean the lint filter in the dryer; and only use the dishwasher or washing machine when a full load needs to be cleaned. When practiced, all of these strategies will lead to energy and monetary savings. As families look to stretch their dollar with each purchase they bring into their home, there are savings to be made in the energy that goes out of the home as well. Employing the suggestions above will allow homeowners to support energy efficiency and protect their financial security at the same time. This guest post is brought to you by Direct Energy. For additional tips on home energy efficiency, check out their Reduce Your Use University.